There were quite a few memorable moments during the NCAA conference tournament games Sunday, but the sequence shown on CBS of 4-year-old Phillip Martelli imitating his grandfather — St. Joseph's coach Phil Martelli — may have been the most indelible. 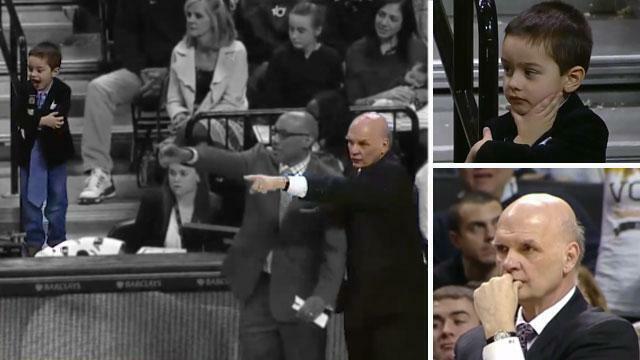 During the second half of a tight Atlantic 10 championship game between St. Joe's and VCU the "mini" Martelli charmed millions when cameras caught him mimicking his grandpa's every move in the first row of the stands behind the Hawks bench. Clad in a sportcoat, tie (down to his knees) and pocket square like the elder Martelli, Phillip was even spotted with a dry-erase marker scribbling down onto a grease board during a timeout (likely nothing resembling an inbounds play). The major difference in Phillip's impersonation, as announcer Verne Lundquist joked was, "he's got way too much hair to pull this off." Beating VCU 65-61, St. Joe's captured the conference's automatic bid for the first time since 1997. The Golden State Warriors were down eighteen against the Portland Trailblazers Sunday night, but Steph Curry's 28 second-half points — punctuated by a showstopping crossover on Mo Williams — helped power the Warriors to a 113-112 win. Leading the Montreal Canadiens 4-1 with under four minutes to go on Saturday, the Ottawa Senators seemed to be in good position to pick up points in the Eastern Conference playoff Wild Card race. But Montreal scored the next three goals — including one with just three tenths of a second remaining in regulation — to tie the game at four. The Habs would go on to notch another unanswered goal in OT for the win.